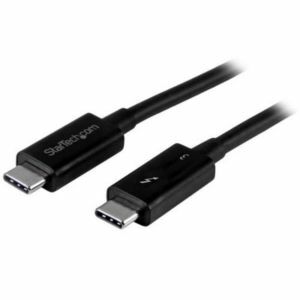 StarTech.com 0.5m Thunderbolt 3 (40Gbps) cable lets you connect to any Thunderbolt 3 port (USB-C�) to deliver video and data to your Thunderbolt, USB and DisplayPort devices. Plus, the cable can provide power for charging your devices, and you can link up to six Thunderbolt 3 devices as part of a daisy-chained connection. cable performs at a rate of up to 40 Gbps, which is four times faster than a USB 3.1 cable. This cable is equipped Thunderbolt 3, USB 3.1, and DisplayPort 1.2 technologies, providing compatibility with a variety of devices. It lets you daisy-chain up to six devices as well as power up devices with up to 60W of power. You can also use this cable to create a peer-to-peer network connection between two computers. Order the StarTech.com 0.5m Thunderbolt 3 (40Gbps) cable today!